The latest Technique of the Month from Quiltworx, Vintage Rose, has arrived! If you would like to make this beautiful quilt, please contact me - I have the first class arranged for Saturday 18th March. There are 2 sizes - the Wall is 74" x 74" and the Queen is 97" x 97". 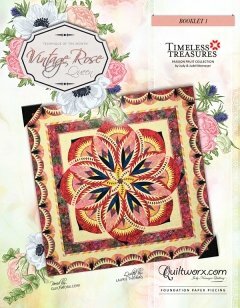 Vintage Rose, along with many other Quiltworx patterns, is now Quiltster compatable. This means you can choose your fabrics, I load them into Quiltster and we colour your quilt before you start to ensure you're happy with your fabrics and their placement within the pattern. It's a great tool! Remember you can book in to come any Wednesday or Saturday to make any Quiltworx quilt! I can see fussy cutting, reverse applique or backings in their future! Check them all out on the website here together with the Aria pattern, coming soon, which uses reverse applique with one of these panels. Many of you have shown an interest in my Half Square Triangle quilt and participating in an exchange. So - here we go! 1. Please only use Laundry Basket Quilts 2" HST papers. When I did this exchange people used papers from all sources and each one turned out a different size! To avoid this, we all need to use the same papers. 2. Make as many as you like! 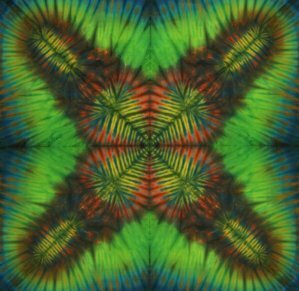 I have kits available with 4 fat quarters (2 lights and 2 darks) and 4 sheets of HST papers for $23.50 (includes postage and makes 56 HST units) or you can buy a pack of papers for $15, which will make 700 HST units, and use your own fabrics. 3. Send in (or drop in) your completed units in groups of 50 (4 sheets worth, holding back 6 units) by 31st March and your surprise package will be returned by Easter with some line drawings of different layouts to help you decide what to make. 4. The more people who join in, the scrappier your finished quilt. In receiving your 50 HST units back, they will be units from every participant - not just swapped with one other. So if there are 50 participants, you will receive back 50 different units! 5. Click here to go to my website where I have posted pictures of different HST quilts, the above mentioned HST kits and the packs of papers. I hope many of you join in with this exchange. They are very easy to make and so much fun when you receive all the different units back.